The first is a slight dogleg right that plays uphill. Drives to the left may catch the trees. 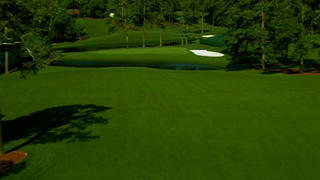 The hole requires a precise second shot to an undulating green. A poorly struck approach may result in a difficult two-putt. No. 2 is a dogleg left which may be reachable in two. 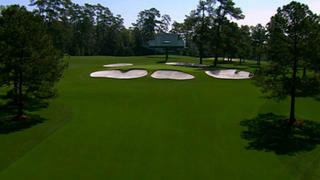 Large, deep greenside bunkers demand special attention on the second shot. A classic short par four. 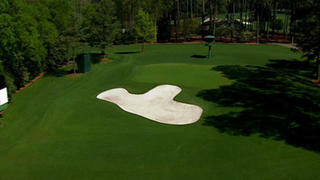 Golfers attempt to hit short of the four fairway bunkers, resulting in a full shot to the green, where it is better to be long than short. 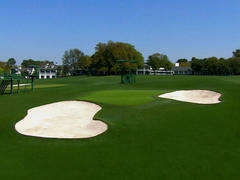 The putting surface slopes right to left, with a thin neck on the left side guarded by a bunker. 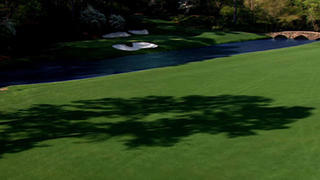 This hole is a stout par three that requires a long iron and is often made harder by deceptive winds. 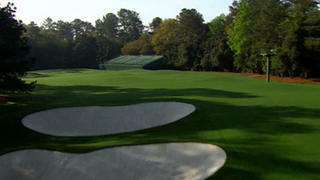 Two bunkers, front right and front left, guard the green, which slopes back to the front. An uphill, dogleg left to a sloping green. The fairway bunkers are deep and positioned to demand accuracy off the tee. To clear them requires a carry of 315 yards. 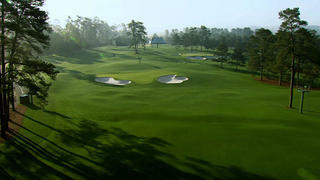 The green slopes back to the front, and a rear bunker catches balls hit too long. This par three features an elevated tee and a large undulating green. The shifting levels of the putting surface from front to back make the pin position very important. 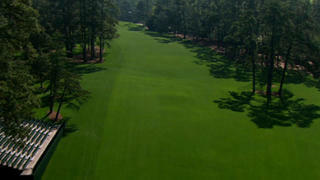 The drive on this tight hole is often played to the left-center of the fairway to set up a second shot from a level lie. From there, a short to mid-iron may be played, but it is important to avoid the three bunkers in front of the green and the two behind. An accurate drive is needed to avoid the fairway bunker on the right side on this uphill hole. The long, narrow green is bunkerless. It is guarded instead by a series of mounds, the biggest of which line its left side. 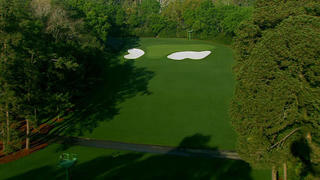 This hole is best known for its green that slopes from back to front. 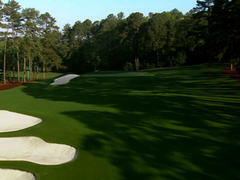 Players often drive down the right side to avoid having to contend with two left greenside bunkers on their second shots. 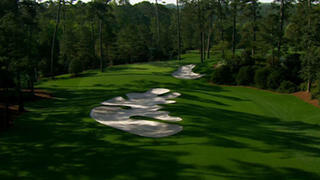 This long par four plays steeply downhill and features a nearly 60-yard-long center bunker well short of the green. 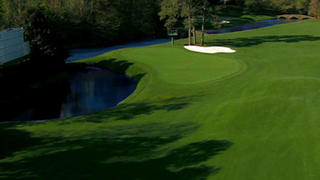 It is traditionally the most difficult hole on the course. 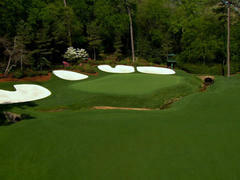 At this hole begins Amen Corner, and wind is often a factor. The tee shot plays downhill and left to right. 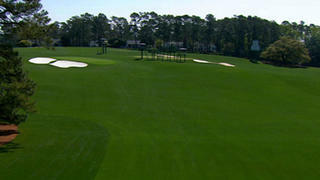 A pond guards the green to the left and a bunker is strategically placed right center. 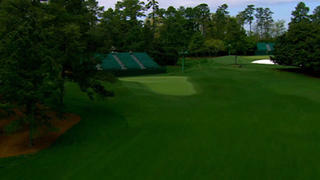 One of the world's most famous golf holes, this is Augusta National's shortest par three. Club selection is often difficult, as varying winds can require anything from a six-iron to a nine-iron for Masters competitors. An accurate tee shot to the center of the fairway on this sweeping dogleg left allows a player to go for the green in two. A tributary to Rae's Creek winds in front of the raised green, and four bunkers threaten behind. The primary defense on this bunkerless par four is a terraced putting surface that drops significantly from left to right. Following a well-placed drive, the second shot will usually be a middle iron. A famously reachable par five when the winds are favorable. A well-struck second shot must be played over the pond and away from the bunker that guards the green on the right. 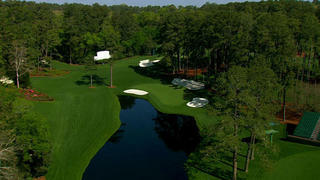 This hole is played entirely over water to a green secured by three bunkers. With the putting surface significantly pitched from right to left, an exacting tee shot is required to set up a reasonable birdie chance. 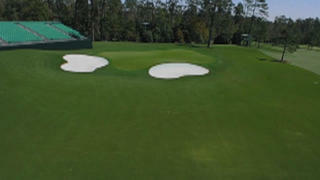 The putting surface at this uphill par four offers its share of challenges, as it seems to slope off in all directions. The back-right hole location is particularly demanding. A February 2014 ice storm caused irreparable damage to most of the tree's major limbs, resulting in its removal. 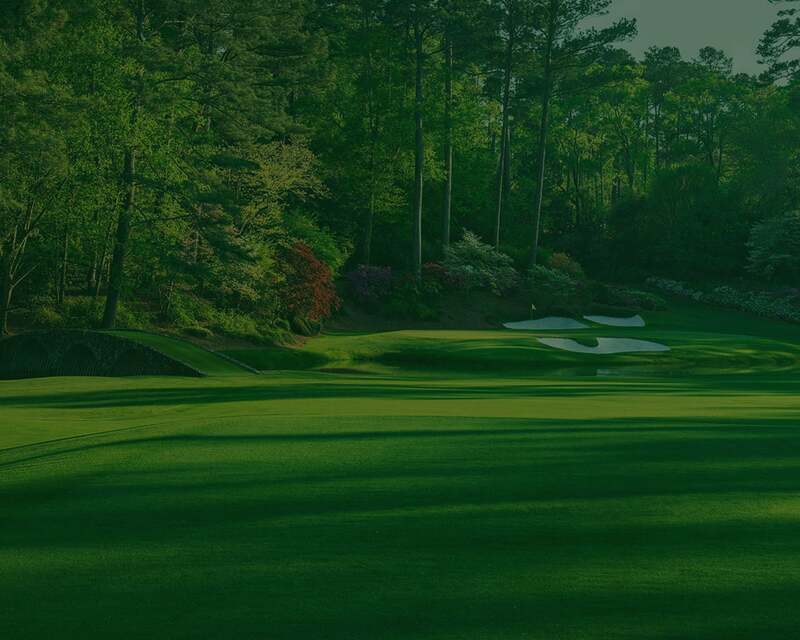 One of the most famous finishing holes in golf, this uphill dogleg right is protected by two bunkers at the left elbow of the fairway. 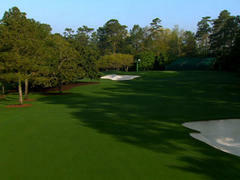 The narrow green guarded by one bunker short-left and another hard right.